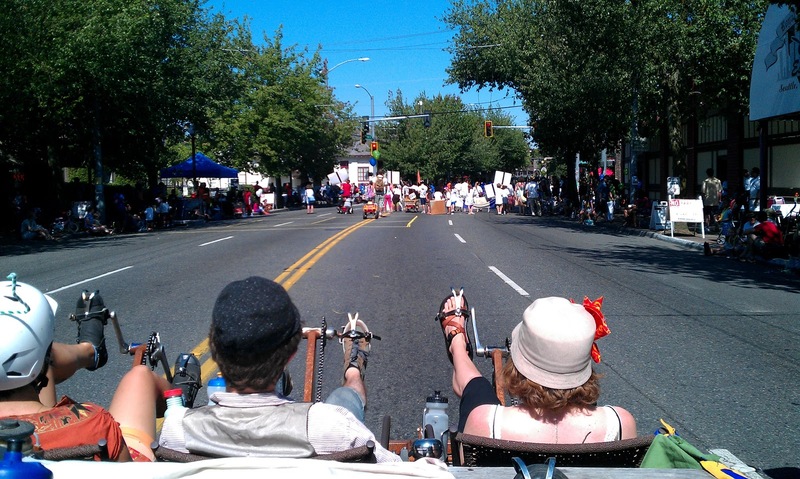 Deep in an email from Columbia City's Bike Works announcing various volunteer opportunities related to the upcoming Rainier Valley Heritage Parade and Summer Streets event, I was asked if I could see myself "pedaling a huge bike powered float." So last Thursday we left our bikes at Bike Works HQ and took the light rail up to Beacon Hill, where this beast made by local bike mad scientist Haulin' Colin lives. Then we pedaled it down the hill to Columbia City. I was told that the pedal powered parade float, or Cyclopy, as we tried calling it, was made by stripping a Toyota truck. The transmission remains, so a driver steers, shifts gears, and brakes while up to seven sets of feet pedal. The afternoon was freaking gorgeous, and I sat back and pedaled while the locals planned a route that minimized blocking traffic and swooping down overly steep hills. 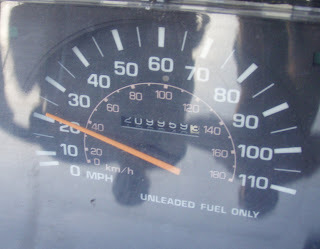 We did swoop down Columbian Way, clocking 25 mph on the intact speedometer before a tire started making trouble, so we braked. 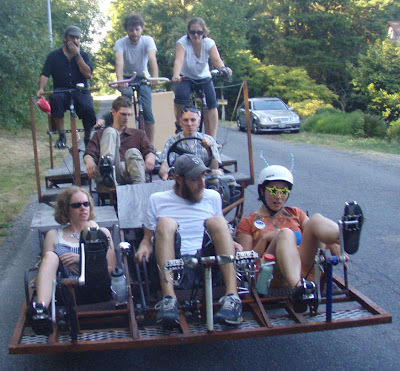 Since the recumbent pedalers up front constitute the machine's bumper, I felt quite nervous hurtling down the hill. It reminded me of how scared I was to try Zoobomb last August. But as in that case, I came out unscathed. I'm a scaredy cat, so sue me. What I really liked was what a spectacle we became. Most passersby stopped to take a picture, and many drivers smiled and waved. I first noticed what an impact an outlandish bike can have when I rode along with Bobby Gadda on his tall bike on Halloween 2009 in LA. People shouted from stoops to ask about it, and he practically had kids running after him through the streets of Echo Park. Bike spectacles make people smile, and that's worth a lot when bikes can be such a source of tension on our streets. Then Saturday came around, and it was time to decorate and pedal the float in the parade. I wore a corduroy moustache, slapped some fuzzy antennae on my helmet, and played a kazoo left over from a performance of "The Lonely Kazoo: A Synthetic Journey to Heaven." Riding in the parade, we waved to smiling spectators. I noticed that more adults than kids waved back. Most kids, upon seeing the Cyclopy, just dropped their jaws and stared. Too much awesome for little brains to comprehend! Afterwards some pedalers celebrated with a very nice homebrewed stout in a very lovely backyard, and then I went out to see how the Summer Streets event played out. Like CicLAvia, Seattle's Summer Streets events use Bogotá's ciclovía as an inspiration to create temporary public spaces for walking, biking, and relaxing in the middle of the street. I hadn't made it to one of the events yet, so I was pretty excited to see so many people enjoying themselves. An organizer told me that a previous event in Greenwood had been packed with many more folks, but personally I found the mix of communities present at the Columbia City event to be quite an impressive feat. At the event I again encountered a factoid I'd heard tossed about before, which is that the local zip code, 98118, is the most diverse in Seattle. While I'm skeptical of claims like that (what are they trying to convey? Having lots of people in ethnic communities doesn't mean the same thing as an integrated neighborhood, and income diversity means something different than ethnic diversity), I did see a variety of programming and participants that showed a coming-together of people who might not always spend time together. So I liked it! Way to go City of Seattle, I didn't know that watching tiny kids perform ballet folklorico was what I needed to make my Saturday perfect. I did notice, though, that people did not seem to be using the full extent of the route (something like eight blocks). On either end, where the activities ended, big expanses of concrete yawned, just waiting to be activated by human life. To end the afternoon, we biked the Cyclopy back up the hill to its home. The locals chose Cheasty Boulevard as our route, which is one of the "Olmsted streets," the parkways designed by the Olmsted Brothers to be part of Seattle's "emerald necklace." By this point I was, how do you say, completely exhausted. I had to give up my seat for a bit so I could take a break and walk. It took us about 2 and a half hours to get the thing back. I got to spend that time with some really neat people. Hooray!